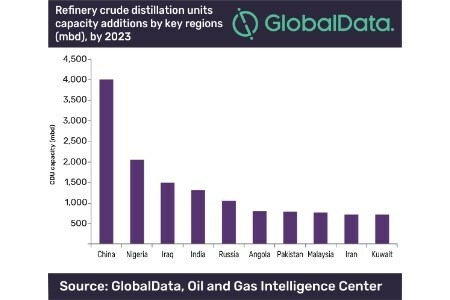 China and Nigeria are expected to be the major contributors to the global refinery crude distillation unit (CDU) industry capacity growth from new-build and expansion projects between 2019 and 2023, according to GlobalData, a leading data and analytics company. The company’s report: 'Global Refinery Crude Distillation Units (CDU) Outlook to 2023 – Capacity and Capital Expenditure Forecasts with Details of All Operating and Planned Crude Distillation Units' states that around 21.58 million bpd of refinery CDU capacity is expected to be added globally by 2023, taking the total global refinery crude distillation unit capacity to approximately 121.45 million bpd in 2023. China is the global leader in terms of refinery CDU capacity additions during the outlook period with 4 million bpd. The country also has the third highest new-build, and expansion capex globally, to be spent the over the next four years. Nigeria is identified as the second largest country in terms of refinery CDU capacity additions. The country will add approximately 2 million bpd of CDU capacity by 2023. With 1.47 million bpd of CDU capacity, Iraq will be the third largest country globally for refinery CDU capacity additions. In terms of capacity, among the upcoming refinery CDUs, Dayushan Island refinery in China, Lagos I refinery in Nigeria and Al-Zour refinery in Kuwait will lead with 800 000 bpd, 650 000 bpd and 615 000 bpd, respectively, by 2023.